Cucumber beetles do not only attack cucumbers, the larvae and adults attack asparagus, broad beans, eggplants, potatoes, certain fruit trees, tomatoes, peas, squash, corn (a favorite), cucumbers, potatoes, fruits, and melons. Cucumber beetles damage cucurbit crops in at least three ways. First, their feeding directly stunts plants and, when flowers are eaten. 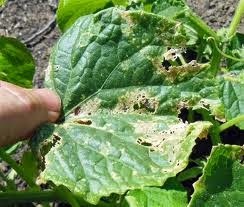 Second, cucumber beetles transmit bacterial wilt disease. Once bacterial disease has entered the plant, there's very little that you can do the bacterium spreads rapidly through the vascular system of the plant, creating resins which restrict the movement of water and nutrients. This causes the plant to wilt and die, sometimes in as few as seven days. Third, adults scar the fruit reducing its marketability. 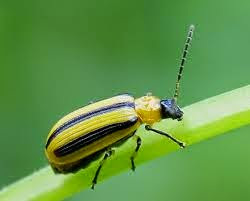 Begin cucumber beetle control as soon as seedlings emerge. Cultural controls include crop rotation, the use of transplants rather than direct seeding, row covers, trap cropping, mulching for predator conservation, the use of reflective plastic mulches and choosing resistant varieties. Kaolin clay is reported to act by making cucurbit crops unattractive to cucumber beetles and because it gums up the beetles’ antennae and otherwise irritates them. 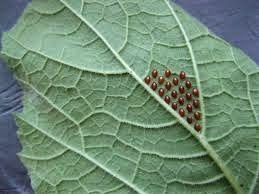 Cucumber beetle eggs on the underside of a leaf, Hunt for them at night and destroy them. 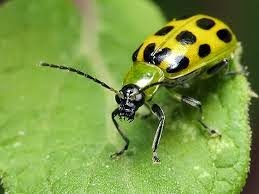 These are the spotted and the striped cucumber beetles. 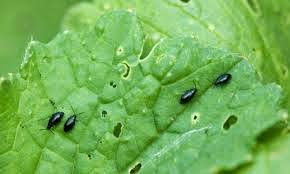 Many species of flea beetles are found throughout the United States and there are many species of flea beetles which attack numerous plants, but vegetable crops are most susceptible to these pests. Flea beetles are so named because of their ability to jump like fleas when bothered. The beetles are small and shiny, with large rear legs. 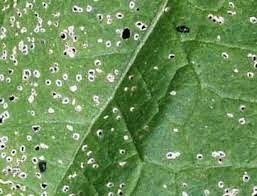 A voracious pest, they will damage plants by chewing numerous small holes in the leaves As flea beetles feed, they create shallow pits and small rounded, irregular, holes (usually less than 1/8th inch) in the leaves, resulting in a shot hole appearance. When populations are high, flea beetles can quickly defoliate and kill entire plants. They feed most on hot sunny days and attack a wide variety of plants including beans, cabbage, corn, eggplant, potatoes, peppers, tomatoes, lettuce and most seedlings. Remove garden debris to reduce overwintering sites. Place floating row covers on seedlings and leave in place until plants are old enough to tolerate beetle damage. Plant a sacrificial crop, such as mustard and radish near garden areas to draw pests away. Place yellow sticky traps throughout garden rows every 15 to 30 feet to capture adults. Beneficial nematodes applied to the soil will destroy the larval stage, reducing root feeding and helping to prevent the next generation of adults from emerging. Diatomaceous earth can be dusted over plants to control the number of feeding adults. Wear a mask when doing this, also do not apply on a windy day.